Peel the kiwi and cut them in pretty thick slices, then stick a popsicle stick in it and put in the freezer. Melt the chocolate over a double boiler, add the coconut oil to it, stir until its completely melted and smooth. Let it cool down to room temperature. 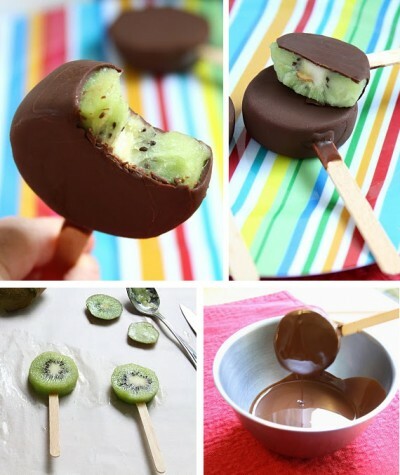 Dip the kiwi pops in the melted chocolate and put it in the freezer or serve it immediately. Tip: you can also try this with other types of fruits, strawberries for example.